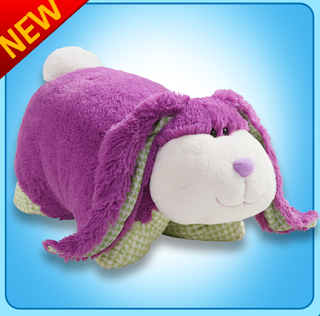 A super-soft chenille plush folding stuffed animal. So cuddly, you'll never want to put it down! Pillow Pets start out as your pal, then un-velcro it's belly, and it quickly becomes your pillow! Both of my children absolutely ADORE their Pillow Pets! They have collected quite a few, and simply love using them as a pillow at night, and taking them along on long car trips. The incredibly soft chenille makes them the perfect cuddly friend during the day and comfortable pillow at night! What I have grown to love as a mother, is that they are washable (they look as good as new after a trip through the washing machine). This is a very important feature for parents of toddlers who, all too often, love to bring their cuddly friends along with them.....EVERYWHERE! 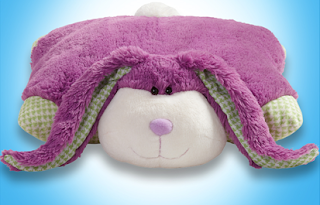 For the 2011 Spring / Easter Season Pillow Pets has introduced the all new "Fluffy Bunny" (Pictured Above and Below) in addition to the popular pink "Cuddle Bunny" (pictured above top). The princess is was over the moon excited when her new pal arrived. The perfect way to welcome Spring, these super cute pals make a great addition to any Easter Basket! The only hard part is deciding which color to get! 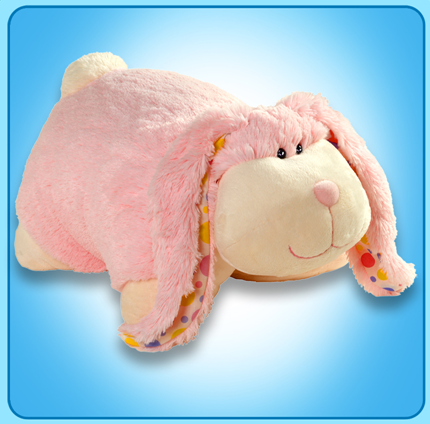 Celebrate the Spring/Easter season with a new pal from Pillow Pets! One Lucky Reader will receive a Pillow Pets "Fluffy Bunny"! Leave a comment~Visit http://www.mypillowpets.com/ and let me know which Pillow Pet your little one would love to have. The comment is considered your entry. Entry to this giveaway ends at 12pm PST April 17, 2011. Winner's are chosen randomly through random.org. Winner's may not have won a previous Enjoy Lighting Giveaway. The winner will be announced in a post within 7 days of the giveaway ending, and contacted through email. The winner will have 48 hrs. to respond or another winner will be chosen. We love the green dinosaur! the dolphin is cute too! Liked them on FB: Stephanie B. The Bumbly Bee is just adorable! :) Love it.